Trinidad and Tobago are an intriguing pair of islands, with a mix of Indian, Asian, English, and African cultures. It also features unique flora and fauna as well as a vibrant nightlife that has produced calypso, soca, and steel drum music. Home to the biggest Carnival celebration in the Caribbean, the country has the strongest economy of any in the Caribbean, and the capital is a bustling city of a half-million. Trinidad has incredible wildlife, while Tobago remains a small jewel unspoiled by mass tourism. Location: Between the Caribbean and the Atlantic, northeast of Venezuela. Size: Trinidad, 850 square miles; Tobago, 16 square miles. Capital: Port of Spain, Trinidad. Language: English, French, Spanish, and Hindi is widely spoken. Religions: Catholic, Protestant, Hindu, Islam, and Jewish. Currency: Trinidad and Tobago dollar; U.S. dollar widely accepted. Weather: Rainy season is June through December. The average temperature is 82 degrees Fahrenheit. It's located outside the hurricane belt. Port of Spain is a big, bustling modern city of about 40,000 and the epicenter of the nation's annual Carnival celebration. Get out into the country and you’ll find natural attractions and wildlife. One fascinating spot is Pitch Lake, which consists of 100 acres of soft, sticky tar that’s the source of much of the world’s asphalt. Trinidad and Tobago are known for their incredible diversity of wildlife, especially birds. You can see the national bird, the scarlet ibis, at the Caroni Bird Sanctuary. The pace is a bit slower on Tobago. Top activities here include diving to see the world’s largest brain coral and deep-sea fishing for big-game fish. Although Trinidad has a large number of beaches, they are not as picture-perfect as Tobago’s. Those on the north shore, including Balandra Bay, are best for swimming. Maracas Bay is popular with locals, has good facilities, and is home to the famous Bake and Shark stands. On Tobago, Pigeon Point Beach is particularly charming; Great Courland Bay has crystal-clear water and unspoiled Englishman’s Bay is somewhat wild—most likely, you’ll have all of it to yourself. Many visitors to Trinidad come on business, so the majority of hotels on this island cater to them and are near the capital, including the Hilton Trinidad & Conference Centre and the sleek Hyatt Regency Trinidad. One exception and a recommended option for nature lovers is the Asa Wright Nature Centre & Lodge, which is a bird-watching facility that’s a true wilderness retreat. Tobago is more of a tourist destination and has some upscale resorts such as the Le Grand Courlan Spa Resort and the Magdalena Grand Beach Resort, as well as less expensive guesthouses and villas. The cuisine on these islands is a happy melting pot of African, Indian, Chinese, English, French, and Spanish influences. You can sample roti, which is a sandwich consisting of a soft tortilla-like wrap and a filling; spicy meat and vegetable vindaloo dishes from India; and pelau, which is chicken in coconut milk with peas and rice. Be sure to wash it all down with a native fruit juice or a cold Carib beer. On Tobago, try Kariwak Village, which has an especially appealing Friday and Saturday buffet dinner. The Spanish colonized these islands, but they later came under British control. Slavery was abolished in 1834, opening the door for contract laborers from India. Oil was discovered on Trinidad in 1910; the islands became independent in 1962. The ethnic mix of these islands, mainly African, Indian, and Asian, makes for an especially rich culture. This is the birthplace of calypso, the limbo, and steel drums. The islands also claim two Nobel Prize winners for literature: V. S. Naipaul, a native Trinidadian, and Derek Walcott, who moved there from St. Lucia. 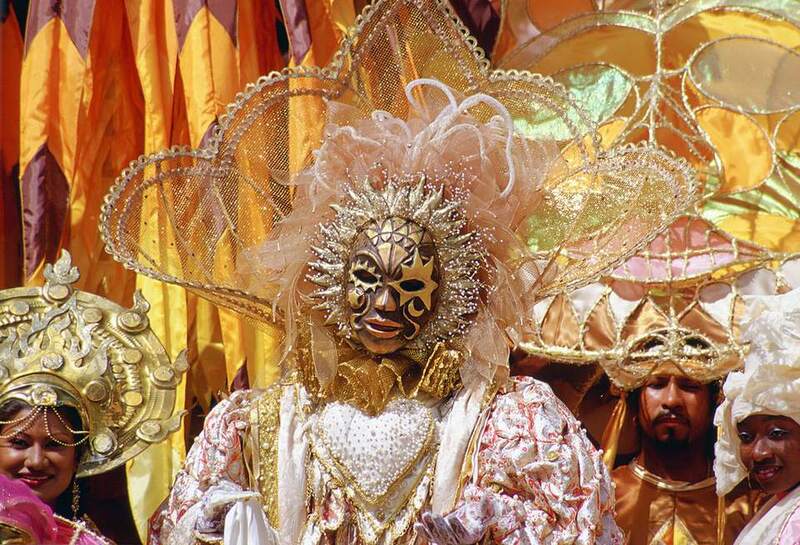 Trinidad’s Carnival, which takes place in either February or March, is a huge festival and one of the best reasons to head to this island. The Tobago Heritage Festival from July to August celebrates that island’s music, food, and dance. As you’d expect of the country that gave birth to such Caribbean musical traditions as calypso, soca, and steel drum, the nightlife—particularly on Trinidad in the vicinity of Port of Spain—offers extensive options. Bars, nightclubs, hanging out at rum shops, dancing, and listening to music are some of the options. Try 51 Degrees Lounge for dancing or Trotters, an English-style pub, if you’re in the mood for a beer and sports. The nightlife on Tobago tends to center on the resorts.